"Que Sera, Sera (Whatever Will Be, Will Be)", first published in 1956, is a popular song which was written by the Jay Livingston and Ray Evans songwriting team. The song was featured in Alfred Hitchcock's 1956 film, The Man Who Knew Too Much", with Doris Day and James Stewart in the lead roles. Day's recording of the song for Columbia Records (catalog number 40704) was a hit in both the United States — where it made it to number two on the Billboard charts — and the United Kingdom. From 1968 to 1973, it was the theme song for the situation comedy "The Doris Day Show", becoming her signature song. Best Music, Original Song for the song "Whatever Will Be, Will Be (Que Sera, Sera)"
Will I be pretty, will I be rich?" I asked my teacher, "What should I try? April 3, 2017 - HAPPY 95th Birthday Dear Doris!! 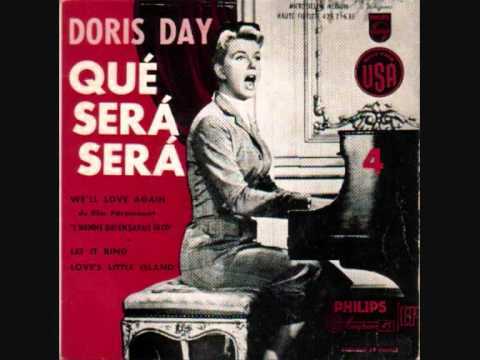 When the ultra-talented actress/singer Doris Day first recorded the song "Que Sera, Sera - Whatever Will Be, Will Be", she did not have much fondness for the song. 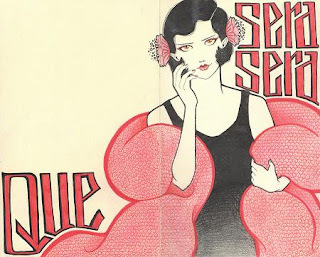 After the final notes of Frank DeVol's arrangement of the original 1956 version of "Que Sera" echoed out of the recording studio and into silence - Ms. Day commented in deadpan fashion: "Well, that's the last you'll ever hear of THAT silly song!". You see, Doris looked upon it primarily as a children's song - lightweight - and she did not think it would have lasting appeal. Fate and popular taste begged to differ. The song from Alfred Hitchcock's thriller "The Man Who Knew Too Much" - which made an important plot contribution to the film - also sold millions of records for Doris and Columbia Records, and has been loved by millions the world over. Well, even Doris herself eventually warmed to the song - so much so, that it became for her what "Over The Rainbow" became for Judy Garland - a true signature song. Doris Day reprised "Que Sera" briefly in two of her subsequent films - "Please Don't Eat The Daisies" and "The Glass Bottom Boat", not to mention every episode of 5 seasons of "The Doris Day Show" from 1968 to 1973. I always liked the original recording from 1956 (as included in the album "Doris Day's Greatest Hits") - as did most everyone else. In 1964, Doris Day was preparing a children's album entitled "With A Smile And A Song", and the decision was made to include a new version of "Que Sera, Sera" which was arranged and conducted by Allyn Fergueson and included a vocal assist by the Jimmy Joyce Children's Chorus. This is the version heard here. My impression upon hearing this 1964 version was that here, Doris infuses the song with a certain degree of extra warmth which is not evident in the 1956 version. In the original version, she sings it sweetly enough, but at the same time it is pretty much a "matter of fact" presentation of the song. Here, the love that she now has for the song in 1964 is quite clearly communicated to the listener. Thus, this is my favorite version of the song by Doris Day. See if you agree.